WSO2’s ‘Ballerina’ is a new programming language designed to bring code-first agility to the challenge of integrating across endpoints. The company’s Chief Executive Tyler Jewell tells the Daily FT that large commercial companies are already using it to create production systems, and are now shipping products based on Ballerina. The new programming language has crossed the reliability threshold and has drawn paying customers, which is a very strong early endorsement he says, and the next step is to grow the ecosystem for developer engagement which is already underway. WSO2 anticipates that Ballerina will become the leading enterprise application programming language of the future. “The biggest challenge is people asking why have you built a new programming language? The default understanding is that this is a fool’s errand. But it is not a fool’s errand. Fundamentally, Java is 20 years old at this point in time, and it’s turned into a really classic, legacy system that drags along a lot of unnecessary complexity in heft that is really slowing down systems development. Our ambition with Ballerina is much more than just developing a new programming language, we think there has to be a modern alternative to Java and if you look at the pure size of the market and the ecosystem that has been created around it this is a pretty big segment to disrupt,” Jewell avers. Tyler Jewell begun his career in middleware, working on integration, and describes himself as a lifelong fan-boy of working in the bowels of enterprise IT. He finds technology problems that need solving by integration or different forms of messaging to be “endlessly entertaining”, and over the past 25 years he has been involved with engineering, evangelism marketing and sales before he got enough experience to start sitting on boards and run a company. Artificial Intelligence (AI) is the driver of integration. The whole point of AI is to create innovative recommendations, and the richness of those recommendations are directly correlated to the richness of the data that feeds the models they are powering. With data being collected in an infinite number of pools, integration brings these together on a common platform. Jewell adds that whilst the stack of integration technologies built up over the last decade is proven best practice, it is still not very agile. Cloud native platforms, such as the ones mooted by WSO2 brings systems to the table that allows IT to create distributive computers that enable systems to be deployed independently and integrated to deliver agility. Part of the reason WSO2 created Ballerina and related software is to create this new distributed architecture running natively inside multiple environments, so developers could write code and simply deploy it in enterprise grade systems minus monolithic architecture. It offers all the richness, reliability and integration, but with totally agility. “WSO2 is the seventh largest company by open source revenues. Here’s a company where all the technology we build is open source and that has created hundreds of millions of dollars in shareholder value. On that basis it’s going really well. The most common flaw or belief that exists out there is that you cannot make money building open source software, and that you need to be proprietary or you need to be opencore, which is a model where the centrepiece is open source but the real valuable pieces are built around the opensource and these are proprietary. “A lot of investors say ‘you got to be proprietary and protect the IT’. But it turns out that the value that people are buying is not in the intellectual property. Good quality customers that work with enterprise systems; the value they have is in the relationship with the software vendor. What they are buying is the expertise to make the software run. The fact that most software companies force you to buy the software first before you get into the value relationship is asymmetric and inequitable. “What enterprises are really seeking is a deep relationship with an expert that can make their systems run alongside with them, and goes to the battlefront with them. That’s effectively what we are selling. It turns out that the subscription our customers pay is almost the same that they would have paid if they went to another proprietary vendor, and our churn rate is lower and expansion rate is much higher. So, on a commercial basis, financially we are doing much better than a lot of proprietary software companies and we are more profitable. 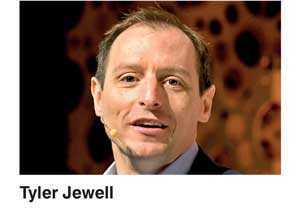 One of the reasons being, we don’t need to staff up a large group of product managers who sit around the table all day and decide what is free and what is not going free, and try to figure what is the marketing story going to be to try convince customers this is the right thing to do,” Jewell explains. WSO2’s CEO sees two big opportunities before his company. One is he believes that all of the middleware will go away, albeit it will take 20 years, and someone needs to rethink the entire middleware stack in a cloud native approach. Currently, his company’s tech teams are toiling away at what that new world will look like that. Second, he believes the world will standardise on agile as an approach to development, though only 4% of current organisations think agile is giving adaptive benefits. But he explains this is because projects have not got agile yet as integration is a problem. If WSO2 enables that integration that’s a massive opportunity, he says. “The software industry is a creative industry, not a technology industry. Every time a company designs and releases a piece of software it’s like making a movie. You have an opportunity to provide creative talent, provide construction talent and there is an analogy that everything that happens on a movie set happens in software development. There are directors, producers, actors, cinematographers and there’s an equivalent role. When you produce movies, you produce it to see if people have a receptive connection to it, and the same thing happens with software. It’s a journey for them, am I improving myself on this journey. “Our job is to stay on this journey, to make the world programmable and then keep vectoring ourselves on that and take on bigger more complex problems as we go, and I think that is what we are doing. So we are excited about that and we are at almost 600 employees and we are growing about 60% this year, and we are going to continue doing that. Frankly if we continue to do that staying on that creative journey and keep having the financial success that we do, we’d be a pretty good IPO candidate too in a couple of years as well. Why not?” he avers.